Climate change and the negotiations are always a hot topic at the United Nations in Bonn, given that the UNFCCC has its headquarters here. 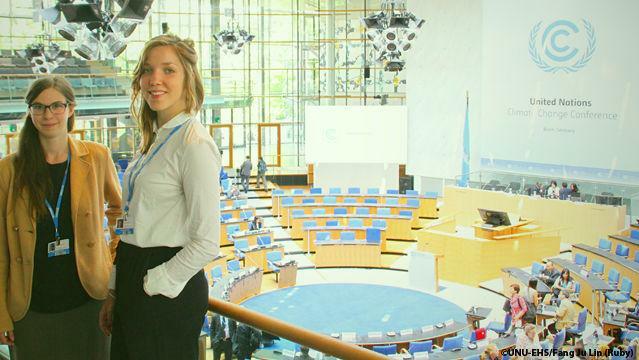 But in June every year, the city becomes filled with negotiators, delegates, NGO members, experts and other stakeholders for the Bonn Climate Change Conference, halfway between the past and next Conference Of Parties (COPs). It is a great privilege for us – the Master students of UNU-EHS – to be part of the University’s delegation and have the opportunity to attend the negotiations and multiple other activities. As newcomers to the climate talks we are nearly overwhelmed at how much is going on here! At any time there can be: two to four side events, one press conference, a couple of “facilitated meetings”, a few “informal consultations”, briefings to certain participants from Christiana Figueres or from the COP21 French presidency, dialogues, workshops, and more. Deciding how to spend your time can become quite a puzzle! Having just spent three incredible months as an intern in the EVES Section of UNU-EHS, my heart lead me to the event on nature-based solutions, and I am glad it did. The first speaker was Jason Funk of the UCS, who presented work by Doug Boucher and Kalifi Ferretti-Gallon on how the land sector is considered in the INDCs of Mexico, the United States and the European Union. Although this sector accounts for about 25% of the world’s greenhouse gas emissions and represents a great potential for sequestration, it appeared to be insufficiently addressed in the INDCs. It’s not that the land sector is excluded from the three contributions studied by the UCS, rather that “none of the INDCs so far allow an assessment of whether countries intend to realize the mitigation potential of the land sector”, said Funk. Next, Marcel Silvius of Wetlands International spoke about the potential of peatlands for climate change mitigation. This topic was very specific, and the content was a little technical, but it was great to hear about concrete measures that can be taken. The last panelist was Patrick Wylie of IUCN, who gave a presentation called “A world of opportunity for forest and landscape conservation”. He commented on the fact that, out of the big toolbox of nature-based approaches, REDD+ is the only tool that gets attention in the climate talks. His presentation and the following discussion addressed the unavailability of data and uncertainties. Wylie acknowledged that “restoration” can mean a great variety of activities and that the choice to carry out one or the other depends a lot on the information at hand. He questioned: once you do have data, and you know you have degraded land, how do you decide where to invest your budget – big or small – for restoration? A practical case for the decision-making course we are taught in the Masters at UNU-EHS. The speaker’s answer to that was to have a look at the manual written by IUCN called “Assessing forest landscape restoration opportunities at the national level”. This side-event was a great learning opportunity. I left with the feeling that I need to update my reading list to to gain further knowledge on nature-based solutions in the context of climate change and I hope some participants left with the feeling that there is lots they can do! I attended the “different mindset” event hosted by the BKWSU. When I first read the list of all the side events of the conference, this one had particularly caught my eye. As a UNFCCC-newbie, I found this Spiritual University to be a surprising institution to encounter within the framing of the UN climate talks. I was intrigued. I was curious to hear the speakers but also to observe what kind of people this event would attract. The panel was a colorful mix consisting of Dr. Katie Mach, the Science Director of the IPCC Working Group II, Francois Becher, the Coordinator of Brahma Kumaris in France, Dr. Nigel Crawhall from the International Network of Engaged Buddhists, Golo Pilz, Renewable Energy Advisor for Brahma Kumaris, and Lindsey Fieder Cook, the Representative on Climate Change of the Quaker UN Office in Geneva. In the first round, each speaker shared insights from their work and how it connects to lifestyle and current thought patterns. The main reflections revolved around the nature of human behavior that produces the climate change we are facing today, and what challenges global warming poses to us – not only cognitively but also emotionally. While much focus is often set on ‘tackling climate change’ and ‘fighting the climate’ to ensure our future livelihood, the panelists argued that there is a need to take a step back and realize that climate change is about how we live, that it is essentially a personal and collective responsibility we all hold. “It is a new game we are playing,” stated Becher, “a game in which we will have to redefine what progress and success really mean”. Then the Q&A session started –it was a very active and honest exchange between the audience and panelists that kept me thinking long after the session closed. Thoughts were shared on how the magnitude of challenges that lie ahead of us often leaves the individual feeling powerless and disillusioned. How can messages about the dismal reality of climate change be communicated in an inspiring way? “To care is very powerful already,” Cook asserted and it is always best to inspire people, rather than make them feel inadequate. Change starts with the empowerment of ourselves, in how we choose to consume, invest and vote. We bring about transformation very simply by ‘walking the talk’ and setting a good example. The climate change discourse is often fear-based and negative, but negativity is very unlikely to attract people and motivate individuals to change. Besides, where do we leave room for emotions that are inevitably part of this discourse? The session ended with a minute of silence. So there I sat quietly, alongside people who each in their own way invest themselves into contributing to a very necessary change towards the future they wish to see. In this brief moment of silence, I recognized how refreshed I felt by the honesty I encountered in the hour that had just passed.